Here is a snowmobile stay between tourism and sport. It will make you discover the northern kingdom of outfitters and the Atikamek aboriginal’s territory. This circuit made of gentle landforms will drive you accross the Hautes Laurentides and Lanaudière regions. You will discover several base camps, these stages in the middle of the forest where you will feel as you were alone in the universe. During this wonderful snowmobile raid, you will also cross the Mont Tremblant park, the Rouge Matawin reserve, the Golden Gate Bridge and the Taureau dam. Maybe you will end up deciding on a one night trip! At the end of the stay, you will discover Quebec in another unique way. You will enjoy our beautiful nature by dog sledding. You will be free to lead your own dogteam with your guide’s advice. Finally, your stay will end with the visit of Montreal and some souvenir shopping. This is a real adventure, which is accessible to everyone in good physical condition. You will leave for a three days raid. This day, you will cross the Golden Gate Bridge heading to St Côme and enjoy its ice sculptures (if the competition is on at that time of the year). You stop will take you to St Michel des Saints at the Pignon Rouge outfitter, a beautiful inn on the shores of Lake Mica. Dinner and overnight at the outfitter. In the early morning, you will race off-road until a viewpoint on the lake overviewing the region. Then you will continue towards the north to join one of the most secluded outfitters. This beauty lost in the middle of the forest will marvel you with its rustic appearance and comfort. You will sleep in the “Lac du repos” outfitter. You will leave along a little path to Manawan, and aboriginal village populated by the Atikamekw tribe. 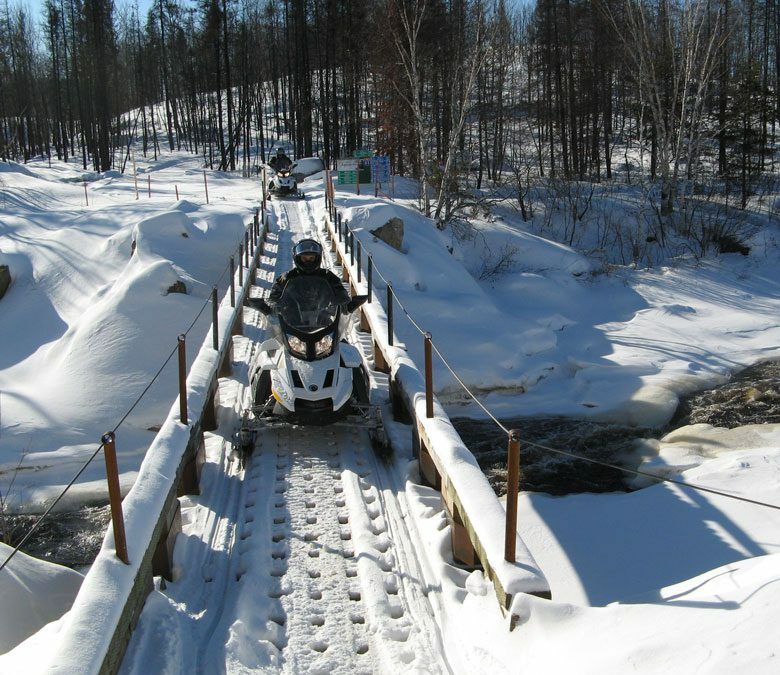 The trail in the forest is hardly wider than the snowmobile and your guide will do the first track on the frozen lakes. All these things will leave you with strong memories. Then you will leave head to the Cécaurel outfitter, an upscale one on the shores of lake Kiamika. You will sleep there. After the famous crossing of Mont Tremblant park and of Rouge Matawin reserve, you will arrive to a snowmobile relay. There you will have lunch and in the afternoon discover the beautiful Caribou trail. At the end of the day you will come back to our center. Dinner and night at the inn. A beautiful day of discovery awaits you. In the morning, you will experience a musher adventure by driving your own dog team through forest and plains. You will discover new sensations of slides and will be able to thank your dogs for this beautiful experience by petting them. Lunch, drive to Montreal and settle into your apartment. Night in a downtown hotel in Montreal. Free dinner. You can ask for Bombardier 900 ACE (90 hp) for 150€ extra in solo and 100€ in duo (per person).